I have an eggplant on my counter. That’s what I was going to have for dinner. I had bought two large chicken breasts that were on sale ($4 for two at Superstore this week – good deal) to have with it. Marry those with the already opened tomato sauce in my refrigerator and you have a good start on something tasty. So yesterday my intentions were clear. But lunch intervened. If you remember, a few days ago I made moussaka. I took some for my noon repast yesterday. It was excellent re-heated. Unfortunately that took the edge off my wanting eggplant for dinner as well. So the eggplant is still on the counter. And the sauce is still in the fridge. That left me with chicken. You would think that something pretty simple would be on the menu, and relatively “normal.” This is where a well stocked cupboard can be a godsend. Readers of my blog well know that I refuse to be normal, for the most part. With a good pantry you don’t have to be. There are many international staples that can be purchased and stored unrefrigerated to pull out on just such occasions. Fish sauce, curry powder, coconut milk, onions, garlic... All things that are easy to get and most of us already have. A diverse cupboard lets you cook from pretty much any cuisine you want if you know what to combine. To me the ingredients I listed spell Thai. A quick run to the grocery easily rounds out anything missing. This is a fast recipe. It’s quite similar to the delicious duck curry that they serve at Talay Thai Restaurant. If you’ve never had it you should. The restaurant is right across from the Waverley Inn (a great place to stay when in Halifax) on Barrington Street. We’re less than two weeks away from our move so it’s imperative that I use up whatever I can from the cupboards so buying curry pastes and the like just isn’t in the cards. Why haul additional things across the province? Especially things that need refrigeration. I will have to (shudder) plan my meals ahead much better than I do now once we move. There will be no quick trips to the grocery store to pick up a red pepper. The nearest large grocery will be about 25 minutes away. That will be an interesting development... But it’s a worry for another day. 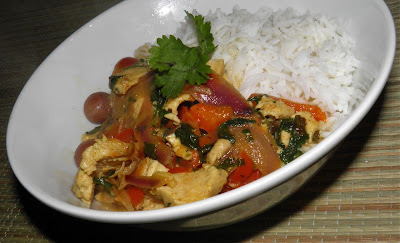 This is a very Thai tasting curry, with mostly common ingredients. Honestly, if you don’t have fish sauce, buy a bottle. It’s that “mystery” taste in many Asian dishes. You’ll wonder why you never had it in your pantry before. Heat the oil in a wide sauté pan or wok. 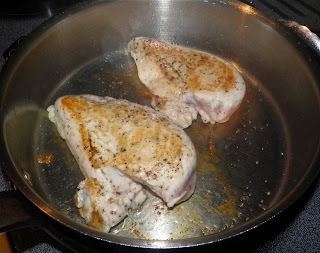 Salt and pepper the chicken and fry in the hot oil on both sides until browned. It will not be cooked through. Remove and let cool. Add the red onion, garlic and red pepper to the pan. Sauté until slightly softened. Sprinkle with the curry powder and stir in the coconut milk. Let the mixture simmer for 6-8 minutes. The coconut milk should be reduced a little. Add the fish sauce, rind and lime juice. 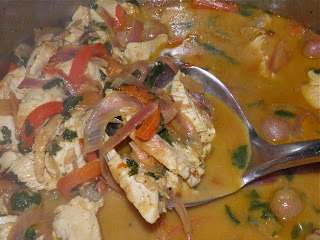 Thinly slice the chicken and add to the curry sauce. Toss in the cilantro and grapes. Let the mixture cook only long enough so that the chicken is no longer pink. Serve on steaming white rice.